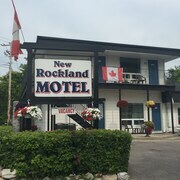 Situated in Kawartha Lakes, this motel is steps from Boyd Heritage Museum and Lock 32. Kawartha Settlers' Village is 0.9 mi (1.5 km) away. Situated in Kawartha Lakes, this inn is steps from Boyd Heritage Museum and Lock 32. Where to find Bobcaygeon hotels near an airport? Where can I find hotels in Bobcaygeon that are near tourist attractions? You'll find only 1 hotel option that are less than 0.1 kilometres (0.06 miles) from Bobcaygeon's downtown, so consider booking your room as soon as possible. 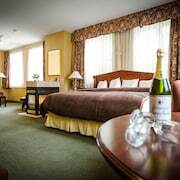 The nearest Expedia hotel is the Holiday Inn Peterborough-Waterfront, ON, Ontario, which is 30 kilometres (18 miles) from downtown Bobcaygeon. Another nearby alternative is the Best Western Plus Otonabee Inn, situated in Ontario, 30 kilometres (19 miles) from the center of Bobcaygeon. 30 kilometres (18 miles) away from the main part of Bobcaygeon, is the Comfort Hotel & Suites. 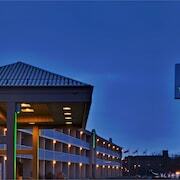 The Peterborough Inn & Suites Hotel can be found 30 kilometres (18 miles) away. Alternative options include the Quality Inn Peterborough and the Super 8 Peterborough. After you've enjoyed Bobcaygeon, you could set out to investigate the many other delights of the Southern Ontario area. Explore Southern Ontario's traditional villages, churches and art museums. Visitors can also make the time to to admire the region's beaches and coastal plains. Travelers in this region of Canada commonly enjoy skiing. 70 kilometres (42 miles) to the southeast of Bobcaygeon is Cobourg, where you can explore Northumberland Mall and Victoria Hall. If you'd like to spend a night or two in Cobourg, check out the The Woodlawn Inn and Best Western Plus Cobourg Inn & Convention Centre. 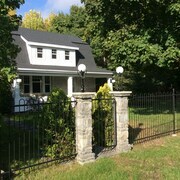 25 kilometres (16 miles) to the southwest of Bobcaygeon, you can also stay at Lindsay, home to the Admiral Inn & Conference Centre and Howard Johnson Lindsay. The Ken Reid Conservation Area and Academy Theatre are popular points of interest to see when visiting Lindsay. If you love sports and really like local games you might like to make a trip to General Motors Centre, which is 75 kilometres (45 miles) to the south of Bobcaygeon. 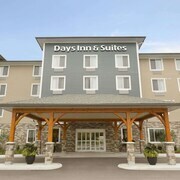 Sports fans wanting to stay close to the stadium can select from the Quality Suites Whitby or the Comfort Inn Oshawa. Pearson International Airport is a convenient airport, and is 130 kilometres (78 miles) away from Bobcaygeon. Conveniently located Expedia-listed hotels include Sheraton Gateway Hotel In Toronto International Airport and Residence Inn by Marriott Toronto Airport. What are the most popular Bobcaygeon hotels? Are there hotels in other cities near Bobcaygeon? 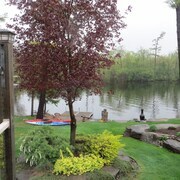 What other types of accommodations are available in Bobcaygeon? Explore Bobcaygeon with Expedia.ca’s Travel Guides to find the best flights, cars, holiday packages and more!